Is this a glimpse of the future, or one of those fads that is going to look awkwardly dated 10 years from now? Unless Australia’s air quality gets a hell of a lot worse from here on in, my money’s on the latter. Indeed, you could well be looking at the Hypercolor t-shirt of the 2010s, minus the popularity. Celebrities such as Madonna, Mick Jagger and Uma Thurman apparently swear by oxygen bars, at least according to the ever-reliable www.oxygenpartybar.co.uk. And as everyone knows, if celebrities are doing it, you should be too. So get on it, Australia. 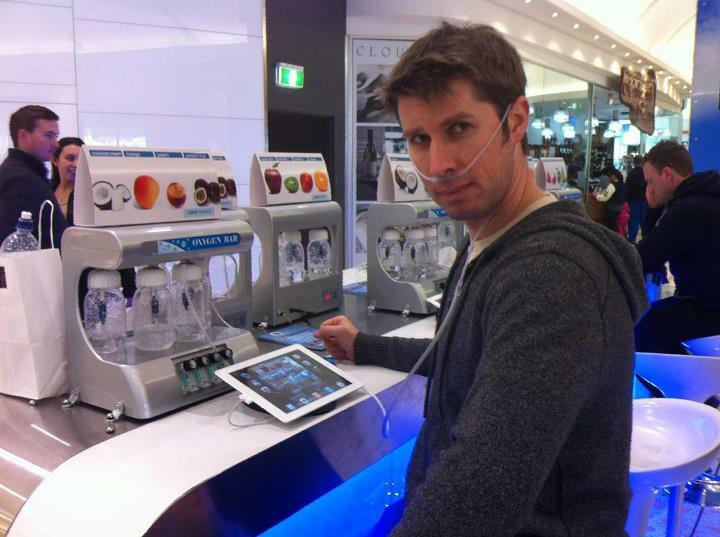 I paid $16 for 14 minutes of “non-medical” oxygen at the O2 Oxygen Bar in a shopping centre in Sydney’s Darling Harbour. The machine lets you control the smell of the flow through a variety of fruit and cocktail aromas. The accompanying iPad seems designed to make the whole setup look high tech, but really it’s just there to help you pass the time while piping oxygen up your nostrils. Because while there’s a certain novelty value to begin with, I found it amazing how long 14 minutes can drag after I’d posed for a few mandatory pics. After you’ve cycled through the available scents, you’re basically just sitting in a shopping centre mucking about with an iPad. The O2 website includes the usual unconvincing pseudo-scientific guff you would expect from a place like this. It claims health benefits that can help treat hangovers, jet lag, and assist with sports and muscle recovery. Oh, please. To be honest, the only thing I got out of the experience was a slight headache, a few laughs, a lot of Facebook comments and a feeling that I’d been had. Give it a go once just to say you’ve tried it – or use the money as a down-payment towards a good dirty martini instead. You’ll get a more reliable pay-off.